The garden city. India’s IT capital. Bangalore has many monikers and is one of India’s most well-known cities. An influx of people migrating to this city every year has done wonders for Bangalore’s real estate market – both residential and commercial segments. For home buyers or real estate investors looking to buy or invest in 2019 and make periodic returns, Bangalore has some great offers. 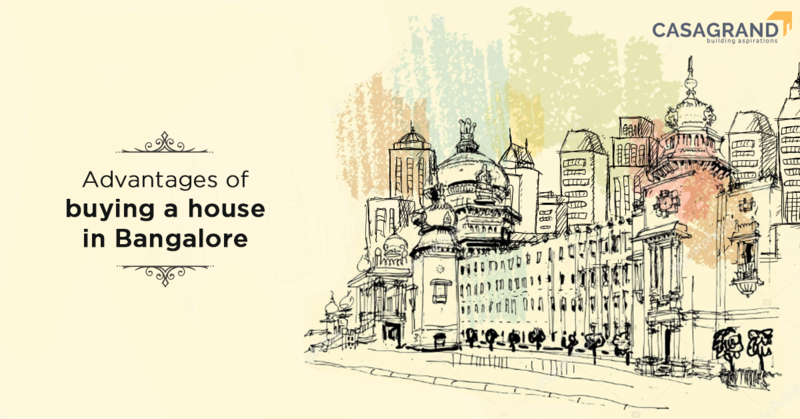 Let’s take a closer look at the advantages of buying a house in Bangalore. Like we mentioned before, Bangalore sees steady migration every year and people from all over India move to Bangalore in search of jobs, opportunities and better quality of life. As a result, Bangalore is brimming with apartment and houses across affordable, mid-range and luxury segments. The variety you get at every price point is reason enough the city is one of India’s real estate hotspots. Several real estate developers flock to Bangalore, too, with the intention of making the most of its burgeoning population. However, be sure to do adequate research before making the final purchase and buying a house in Bangalore – it’s one of the most common real estate mistakes you should avoid. Buying a house in Bangalore is a lot more affordable than other cities in India. The amount of money you would spend on an apartment in Mumbai or Delhi would get you your own independent home in Bangalore. If you’re more comfortable with a mid-range or affordable home, too, you can get a property with all the characteristics of a superior home in the heart of the city without burning a hole in your pocket. No matter what your budget, size of your family, or whatever criteria you have to fulfil, Bangalore is sure to have a home that suits your every need. Bangalore is one of the country’s most cosmopolitan cities and boasts of a multi-cultural and diverse populous. Many of these people move to Bangalore owing to work in one of the many MNCs and IT parks. So when you think of buying a house in Bangalore, one major advantage you experience is connecting with people from all walks of life and expanding your social circle. And if you’re thinking of heading out of the city, Bangalore has several places to visit on weekends! In order to cater to the ever-growing population, real estate developers in Bangalore construct huge apartment complexes. These massive projects, in turn, attract a lot of physical and social infrastructure to be developed around or close to them. Ultimately, these properties become self-sufficient, saving you from making trips to the city centre or neighbouring areas. With every new project coming up, the potential of developing infrastructure hikes up property rates. If you’re thinking of renting out or subletting your home, then Bangalore is the place to do it in. Your property will see good appreciation every year thanks to large-scale development. If you’re an NRI looking to buy or invest in real estate in India, then buying a house in Bangalore is the right choice for you. Don’t forget to check out our ultimate NRI guide to buying property in India for in-depth information. It’s a known fact that Bangalore is home to a number of foreign nationals as well as Indians with a global mindset. These are people who are well-travelled and would like their home to emulate those of the world. Developers in the city are doing their best to cater to global citizens like these, and as a result, apartment complexes in Bangalore come with world-class amenities. Facilities like indoor gyms, swimming pools a play area for kids and landscaping are commonplace in Bangalore. So no matter what kind of home you choose to buy or invest in, you can be assured that it will give you every amenity for you and your family to live a comfortable life. Safety is always one of the biggest concerns that come to mind when buying a new home. Apart from potential burglary, you will also want your family to be safe, particularly if you have children or elderly people living with you. Bangalore is one of India’s safest cities, so you can rest easy knowing you and your family will not face any difficulties. In addition, almost all homes today, come with round the clock security. This will give you peace of mind, especially if you work long hours or have to travel often. You can also be assured that your property is structurally sound. Real estate builders, too, take several precautions when it comes to constructing new properties. This is one of the many reasons you should consider only a reputed builder when purchasing a home. Many fly-by-night developers cut corners when it comes to construction and thus compromise on your safety. The combination of a burgeoning population, a cosmopolitan crowd and attractive property prices have turned India’s IT hub into a real estate hub. Purchasing property in a particular city is tethering yourself to that place. And no other city can offer you as many advantages as Bangalore will. Casagrand has a number of properties in Bangalore across prime locations like Casagrand Royce in Hoodi, Casagrand Lorenzo in Kogilu, Casagrand Luxus KR Puram and Casagrand Esmerelda in Sarjapur. So head over to Casagrand today and find your dream home in this vibrant city.